Whew! Our summer series ended on Tuesday night last with a beautiful evening in Hollywood forest. We had a cunning plan to upload the results to the IOA website and let the league calculator do its number crunching. We had already tested the internet connection and while it wouldn't work in the village a location near the road was found to work ok. Sadly OR wouldn't load and attempts to find OR on the new IOA website proved fruitless. The old IOA website (which I believe everybody was still using) has been disabled. A mad dash home to get the results uploaded and the league results printed led to a bit of a delay. The event barbie meant that the competitors were happily swilling pints and scoffing burgers and didn't seem to be too upset. Ger Butler retained his lead on the long course. Una May pipped Tony Joyce to take the honours on the medium and sadly for the Joyce family Caoimhe May did the same to Daniel Joyce on the Adventure course. 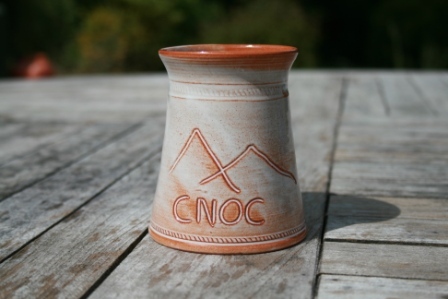 Beautiful mugs (hand made by Hillary Jenkinson Crannmorepottery.com) and CNOC buffs were the prizes. Thanks to all CNOC members who made this series possible and of course thanks to all who competed. We hope to do a survey in the near future to assess the reaction to the new scatter format. We intend to include the Hollywood event in this year's league results. To make this possible we will upload the results at 20:30. If you are not back by then you will not be included in the league tables. Current results are here. 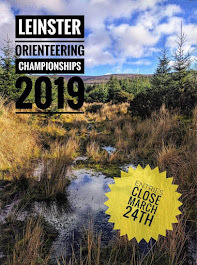 The CNOC babes (and Pat) will be manning the barbie afterwards and all are welcome to have a pint and a burger and of course to discuss the course you should have taken. Pre-entry is available and we would appeal to all to enter before the event. Entry fees: Adults €7, Juniors/Students/over-65s €5, Families €15. Groups by arrangement, please let us know in advance if you are bringing a group. SportIdent electronic timing, SI cards will be available to rent for €2 each. The format will be the same as last week – a “Scatter” event with 25 controls altogether. Adventure Course: Get 7 controls of the 25. You can get any controls in any order, but the best route is to go to controls nos. 1 to 7 in numerical order. Medium Course: Get 15 of the 25 controls in any order. Long Course: Get 22 of the 25 controls in any order. Groups by arrangement, please let us know inadvance if you are bringing a group. Adventure Course: 2.0km (get controls nos. 1 to 7 ). You can do them in any order but numerical order is the best route. Medium Scatter Course: (Get 15 out of 25 controls in any order) optimum route 4.4 km. Long Scatter Course: (Get 22 out of 25 controls in any order) optimum route 6.2 km.